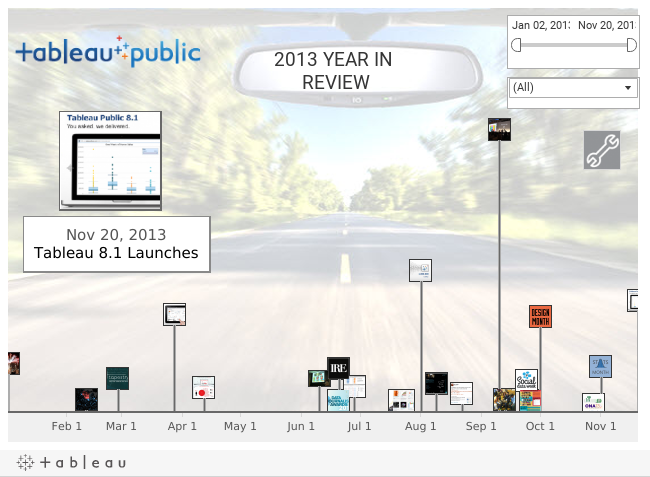 2013 was a year to remember for Tableau Public. We launched two new versions of the product, kicked off two new conference franchises, expanded the data limit from 100,000 rows to 1 million rows, and gave everyone their own author profile page, for starters. Then, we watched the community of authors take what we gave them and create more than we ever imagined. We'd like to thank everyone who helped make 2013 what it was. We'll announce the Top 5 Vizzes of 2013 in early January after you've had a chance to vote for your favorite. We'll open the voting between Christmas and New Year's, so be sure to make your vote count. Who's in the running? It's down to 25 selected Viz of the Day winners, which are all dangling on display at Jewel Loree's 25 Days of Viz-mas advent calendar. As great as 2013 was, 2014 is shaping up to be even better. First and foremost, the Mac version is right around the corner. It will launch before the new year is too old. Additionally, tableaupublic.com will be getting a complete refresh, and we're contemplating adding community features to your profile pages (follow authors, anyone?). We're also going to make interacting with vizzes much more fluid and give the viz footer a complete makeover. Basically, we're aiming to make the entire year one continuous Christmas for our authors. What we've noticed is that the more we give, the more our community of authors just gives right back. Lastly, we'd like to wish you and your family a Happy Holidays. We hope you enjoy reflecting back on 2013 with us, and we're excited about what lays ahead.